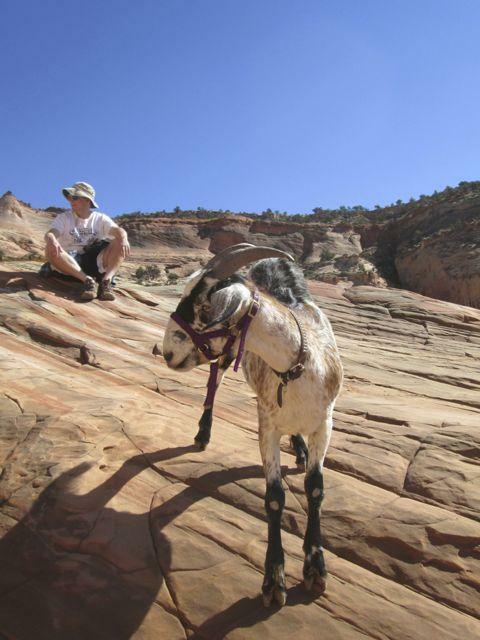 We took the trip from Escalante to Rye in two days so we’d have time to stop along the way. 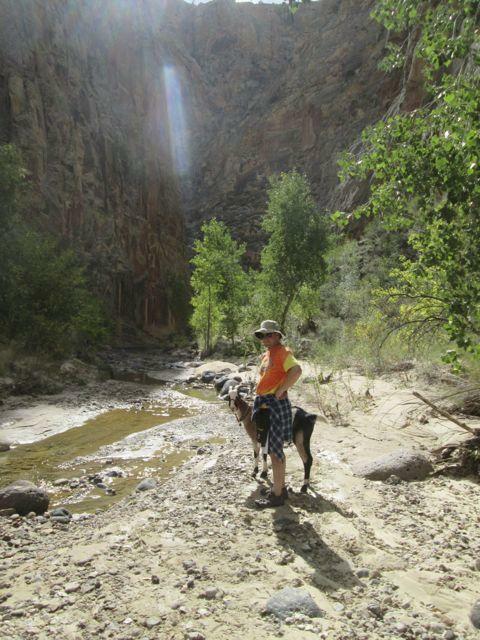 We decided to swing back by San Rafael and hike partway up Little Wild Horse Canyon. There was water in places because of a rainstorm earlier in the week. 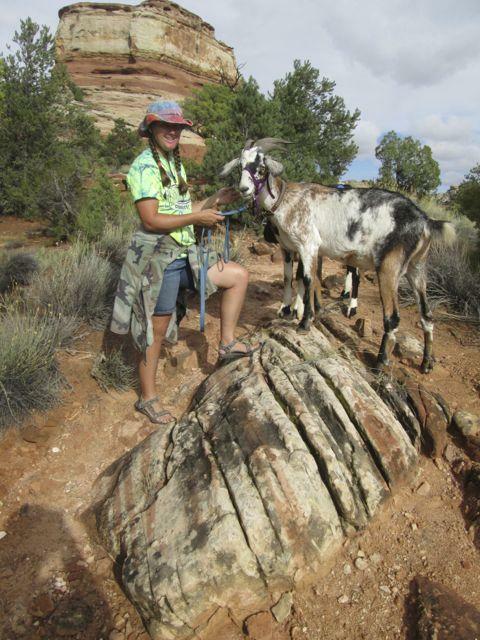 We found fossilized footprint evidence of massive prehistoric goats! 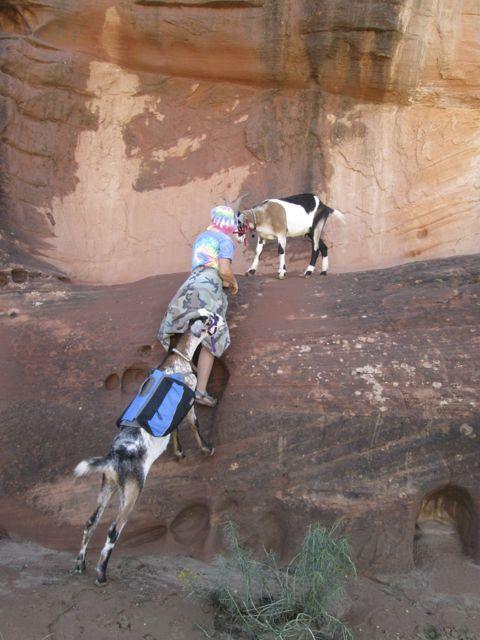 We came to a boulder that was easy for people and young goats, but Cuzco could not get over it. 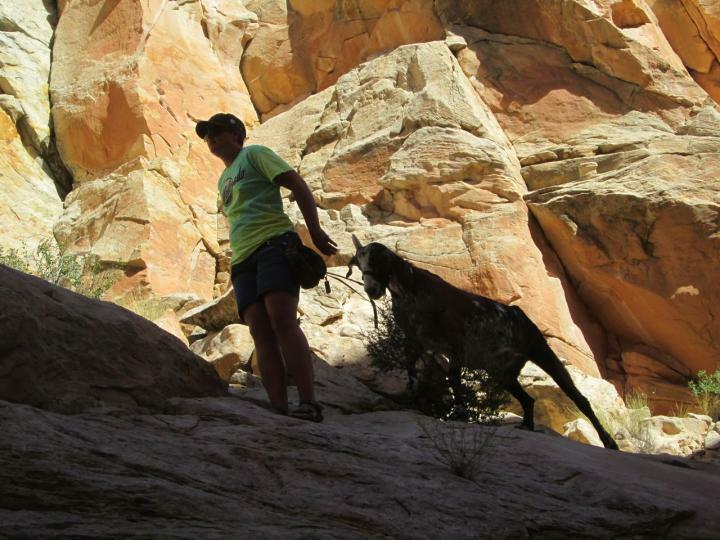 I ended up taking Cuzco up the canyon wall and around. This was fairly easy on the outward journey, but proved quite difficult on the return. 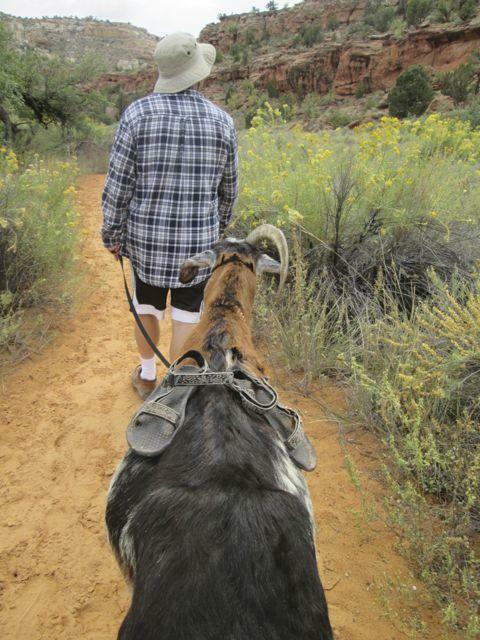 It took us almost half an hour to figure out how we were going to get our big guy back to the trailhead. 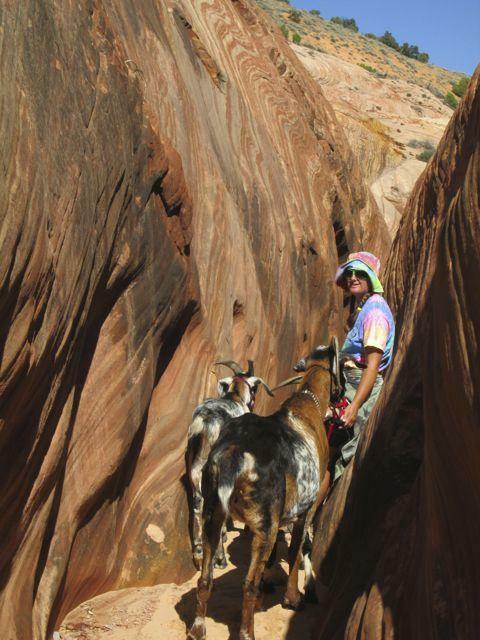 He tried scrambling up the canyon wall the way he’d come, but the slope that was easy to slither down turned out to be too steep for him to climb up. Poor fella. 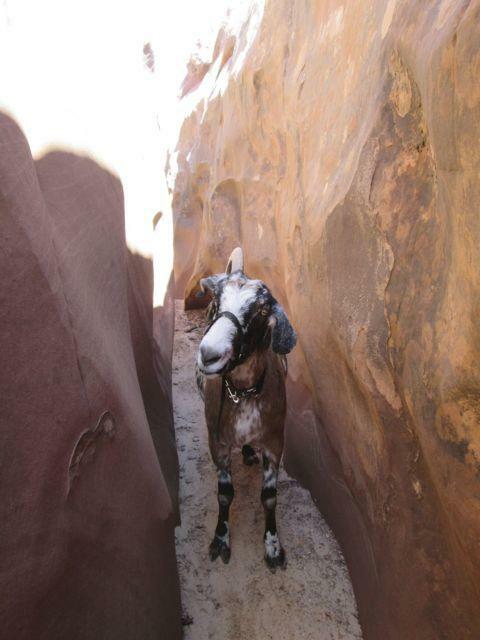 He tried his hardest and was very cooperative to try to follow me up every weird route I tied to lead him along. I finally ended up taking him along a very narrow shelf with a low ceiling where we both had to crouch down. 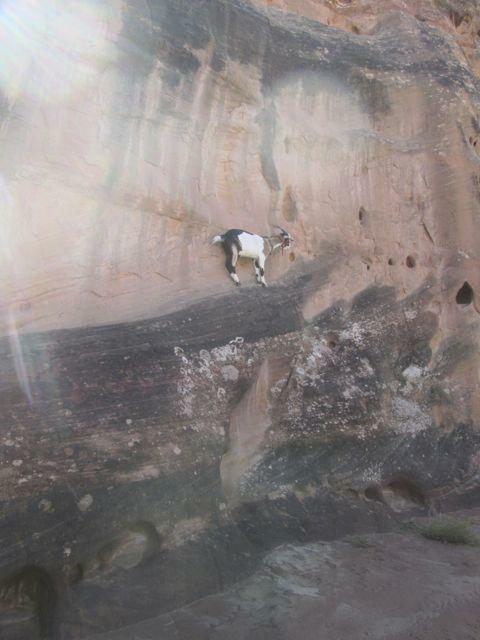 From there I was able to scramble down to the narrow people trail (not navigable for hooves), but Cuzco had to leap on top of the high boulder. The only way down from there was to jump, and jump he did. 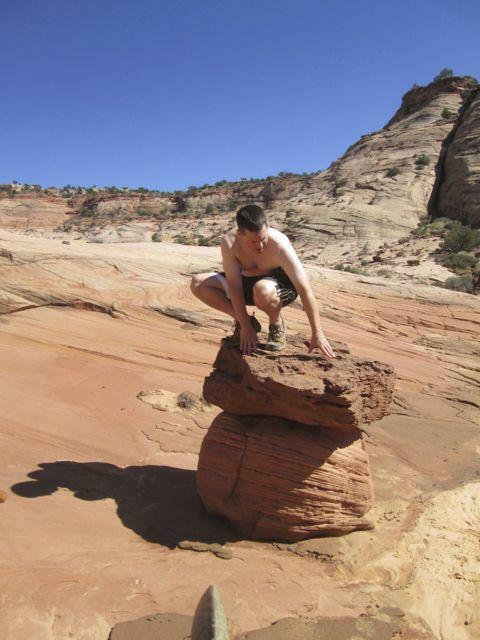 It was a long way down (probably six feet), but luckily the landing was soft sand. 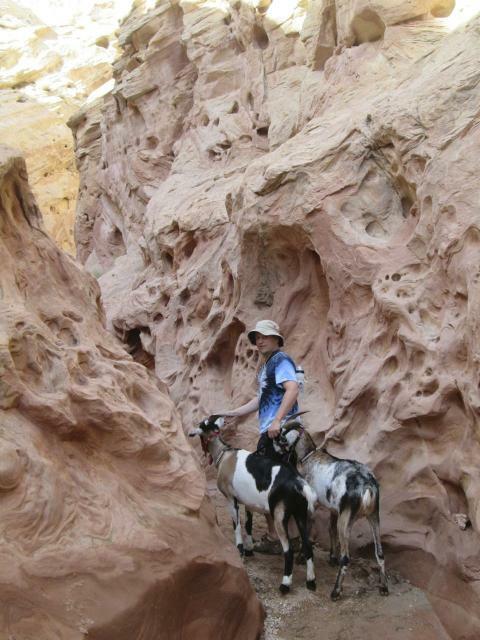 The canyon walls were weird and beautiful. 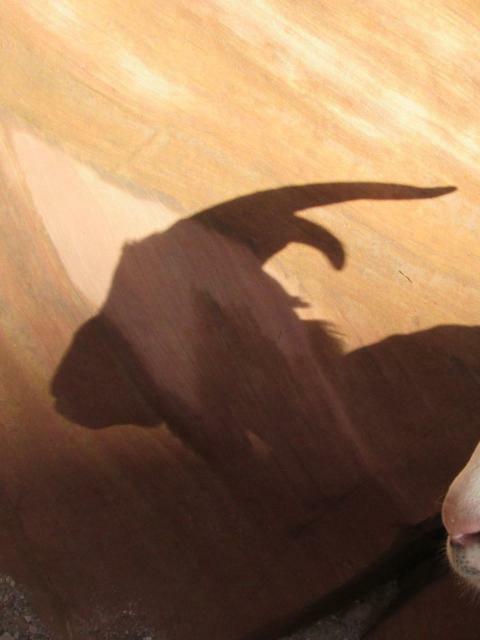 Slot canyons make for some great shadows. After hiking for maybe an hour, the canyon opened up before continuing on into another narrow slot, and here we decided to take a break before heading back down. 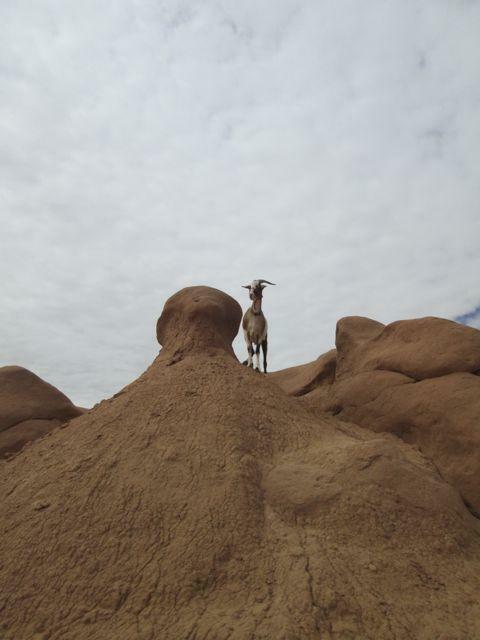 We climbed up onto a big rock and let the goats browse. Whatever that bush is that Sputnik is eating, the goats couldn’t get enough of it. The stuff was like candy to them and we had a hard time pulling them away from it when we had to leave. A final look back at the canyon. I hate it when they do this! Makes me nervous. At least there’s water at the bottom of this one! Phil found a pedestal. 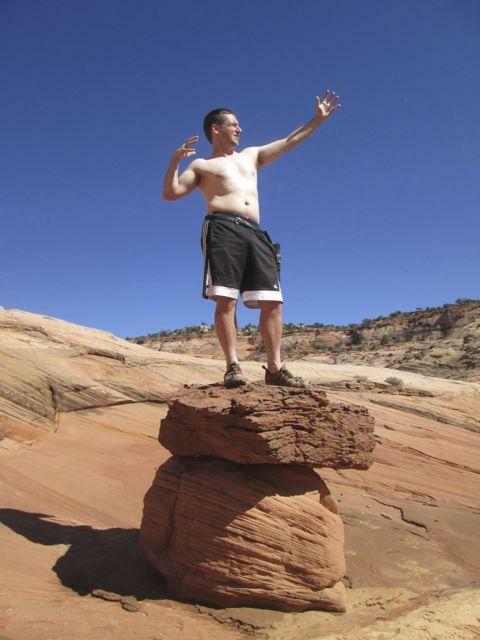 Phil can’t encounter a pedestal without taking off his shirt and posing in statuesque splendor. Finn cannot see someone else pose on a pedestal without sharing the glory. Finn can’t help it. It must be some kind of disorder. Finally, Finn gets the rock to himself! On our way back I found a shelf I wanted to sit on. But with a rounded edge and nothing to grab hold of at the top, I couldn’t quite get up there. Finn, however, was quite curious what I was after and he decided he needed to investigate. Twice he leaped, scrambled, and fell back down with a thud. I thought he was going to give up after the spectacularly failed second attempt, but he backed up from the wall, gave his tail a quick, determined wag, and leaped with all his might. 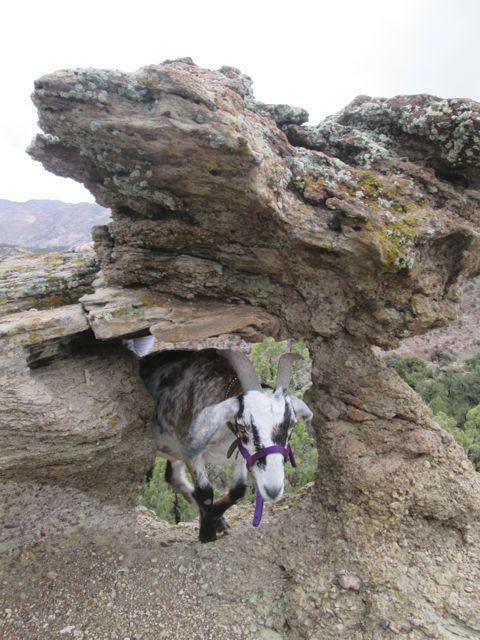 He made it to the rounded edge and started to slide back, but he clung tenaciously to the rock with his front toes, paddled his hind feet, and made it up. Naturally, he had to strut. Finn plunked his nose down in a mud patch and then gleefully tried to wipe it on everyone else. 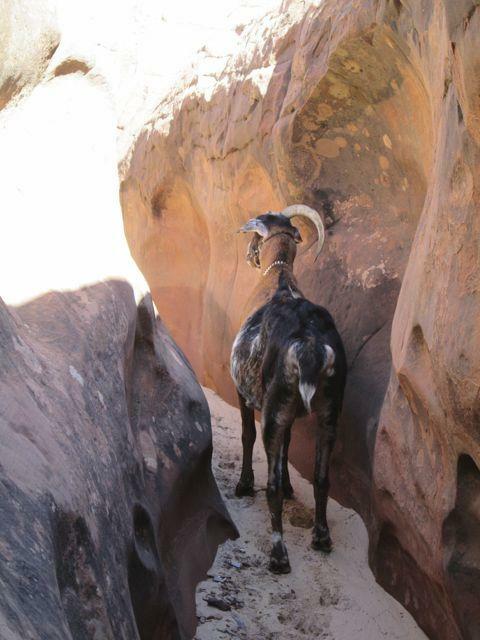 Considering how long and narrow the Bighorn slots were, it was surprising how few obstacles were in them. 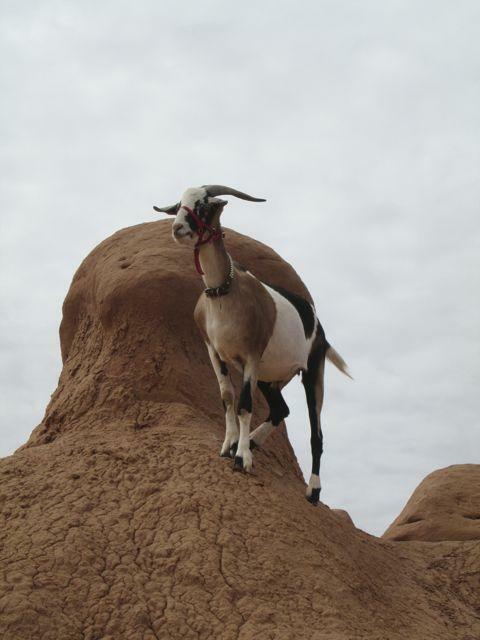 However, we did eventually encounter a fallen boulder that Cuzco could neither go over nor under, so we turned back. I hope one day to go back and explore further. 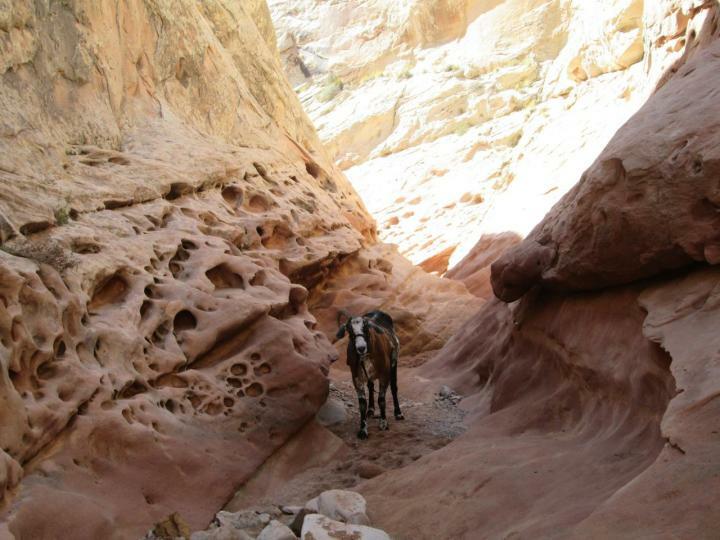 Younger goats should have no problem with this canyon. One of the obstacles was a fallen tree that luckily had just enough space to allow us to crawl under it on hands and knees. I had to remove Sputnik’s pack so he could make it. 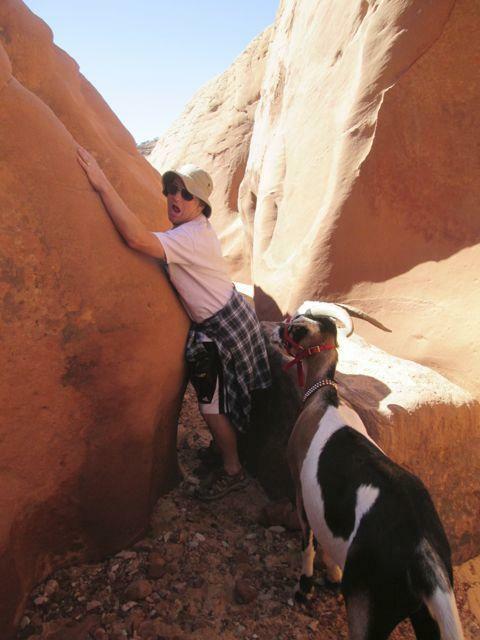 The old goat gave it a whirl. 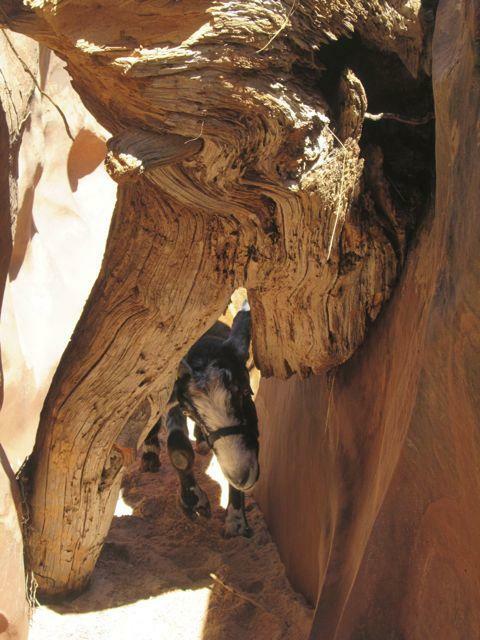 Climbing under things was always Cuzco’s speciality. Did I ever tell how he squeezed into a chicken coop through a 12″ x 12″ door when he was five years old? Yep, he’s still got it! 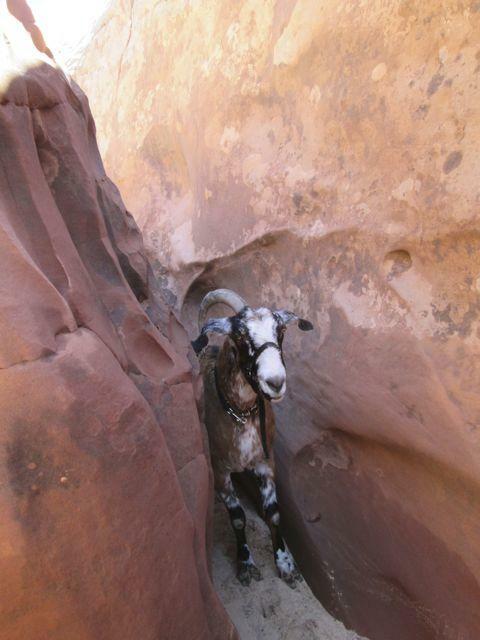 …but Phil got stuck once or twice! 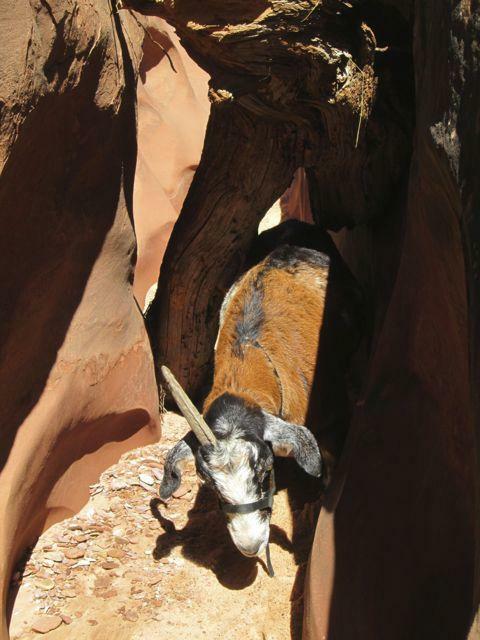 Not long after we started up Bighorn Canyon, we began to encounter shallow slots and beautiful striped sandstone. The slots may have been shallow, but they were quite narrow and surprisingly long. The colors on the walls were simply spectacular. 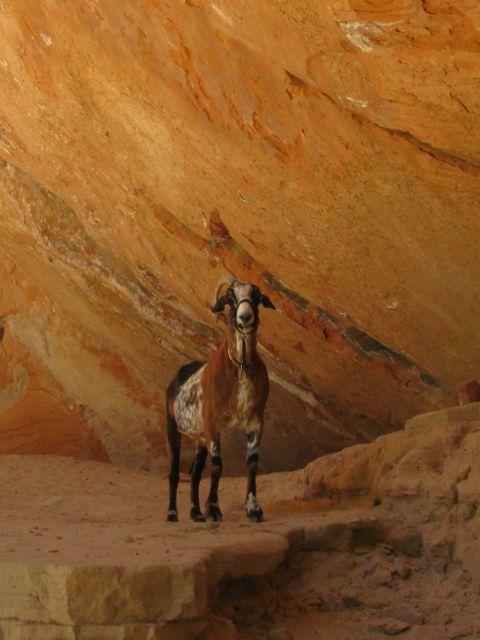 We climbed out of a break between slot canyons and had a picnic lunch here next to a canyon wall that looked like it might have been a mural. 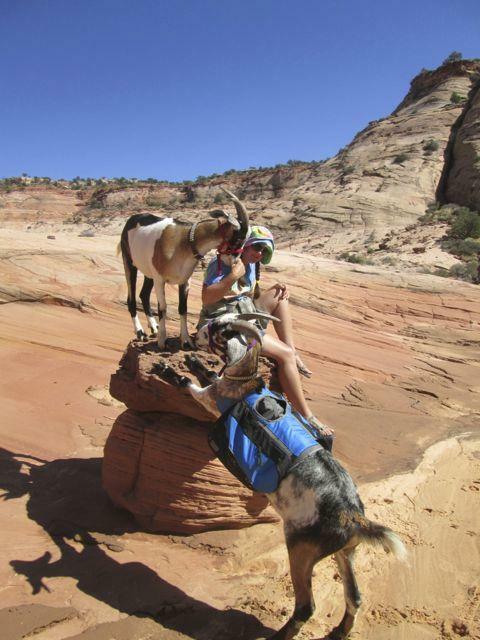 After lunch, Sputnik took the pack and we journeyed on over yellow slickrock. 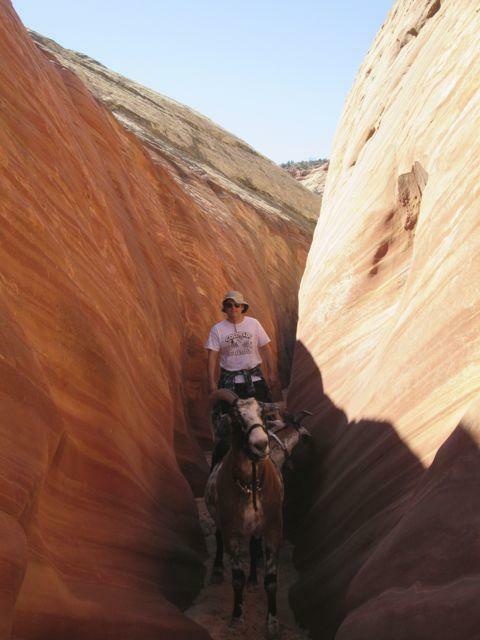 Then back into another slot canyon. 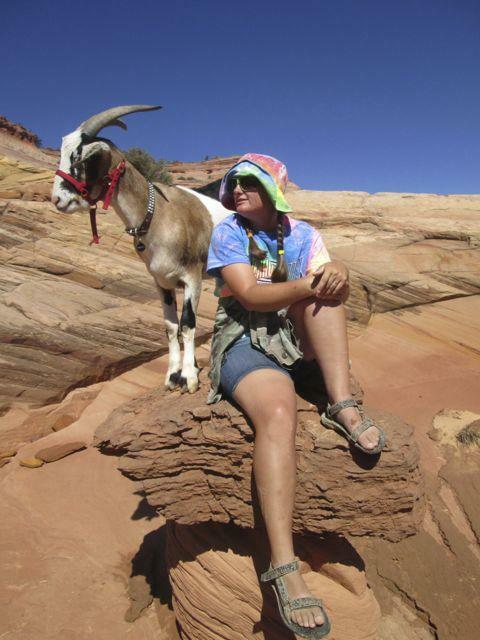 Our final day in Escalante was probably the best. 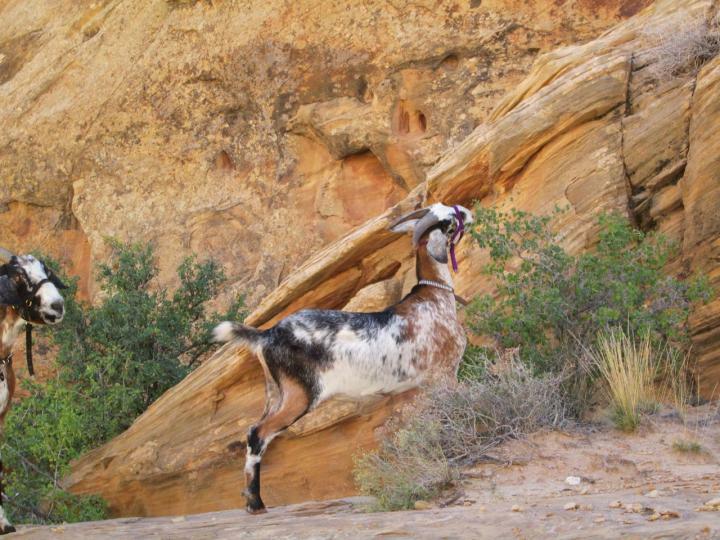 We hiked a portion of Bighorn Canyon and encountered some of the prettiest striped sandstone we’ve ever seen. But more on that later! 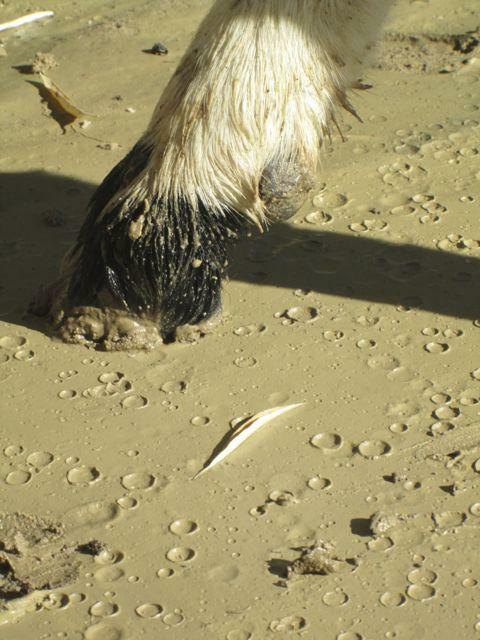 First we encountered a lot of mud. The rain we’d had the two days previous had turned this normally dry wash into a bed of wet and very slimy clay. Phil and I had a few close calls, but I’m relieved to say that neither of us came to grief. While it would have been funny to look back on, the prospect of ever getting that gunk out of our truck seats was enough to make us tread very cautiously up that stream bed. Some of the mud looked like moon craters. 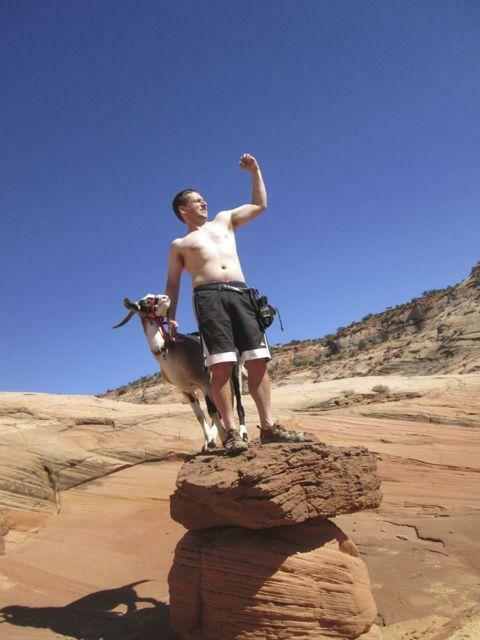 GIANT GOATS ON THE MOON! RUN FOR YOUR LIVES!!!! 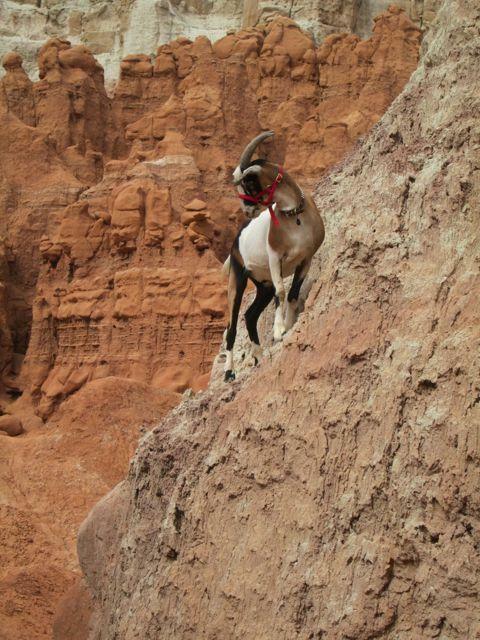 Cuzco doesn’t do daredevil stunts either. He doesn’t need to. The first interesting feature we encountered was this row of giant dome-like rocks, the first of which had a tiny hoodoo on the very top. I wanted to climb up to it and even worked out an ascent plan, but when I contemplated a rope-less descent I decided that discretion is the better part of valor. 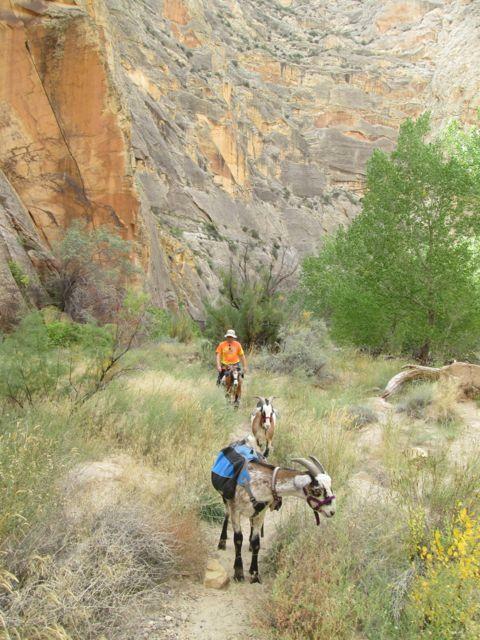 The turn into Bighorn Canyon was marked by a “hanging gate” on the hand-drawn map given us by our B & B hostess. Phil was very intrigued by the idea of a hanging gate and had to get pictures of its ruins. 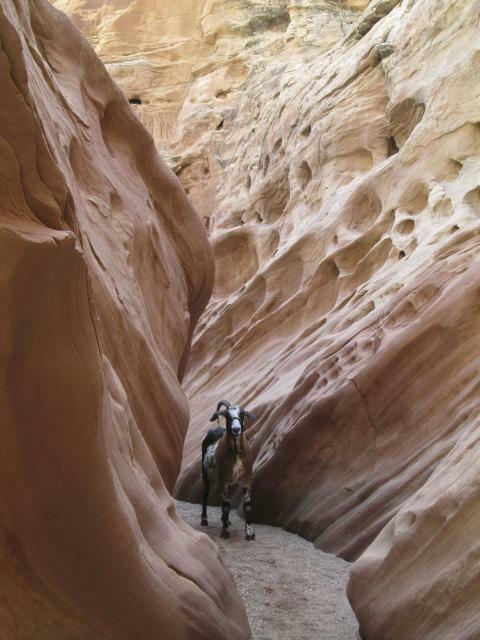 The footing changed from gray clay to wavy pink sand the moment we turned into the canyon. 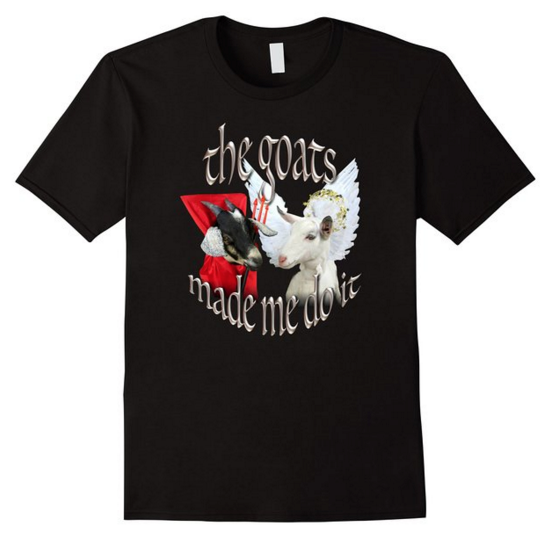 There were also goats falling out of the sky. Monkey see, monkey do… cautiously. 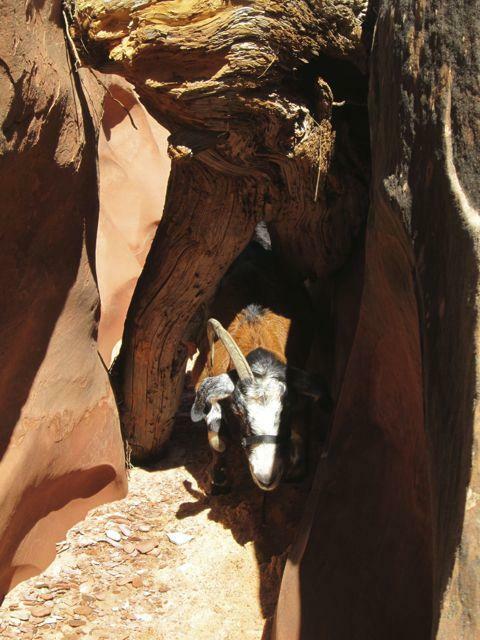 We had plenty more daylight after Calf Creek Falls, so we headed just down the road to the Hwy 12 Escalante River access where there is a short hike up to some petroglyphs. 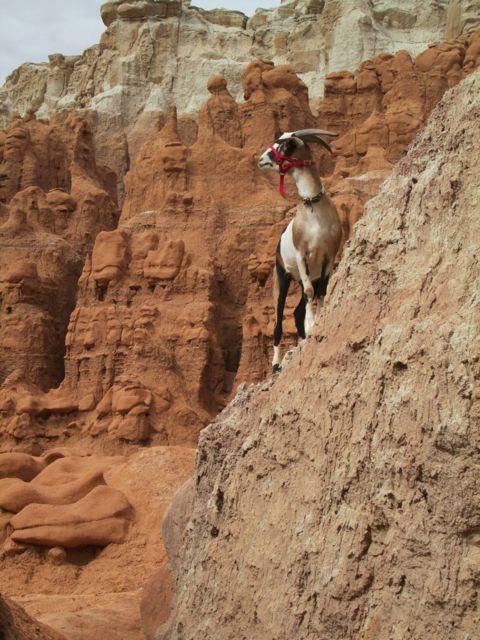 Unfortunately, we could not take Cuzco on this hike. 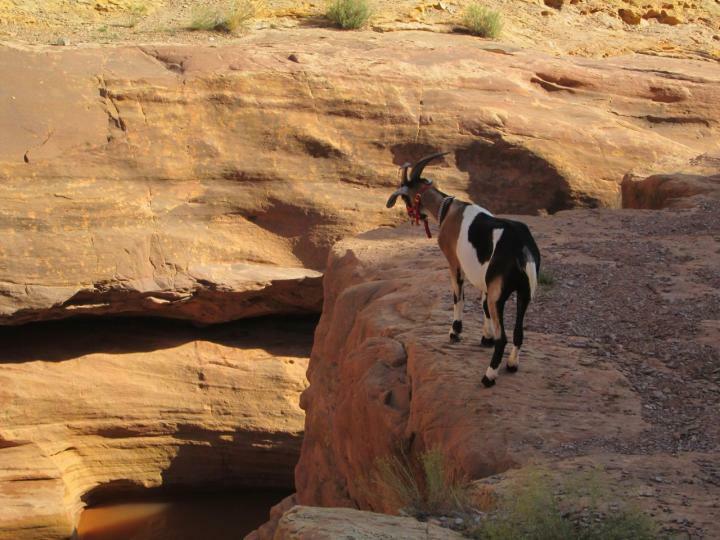 There was a rock shelf that was simply too high for him to climb or jump. He tried, but it was too much for him. 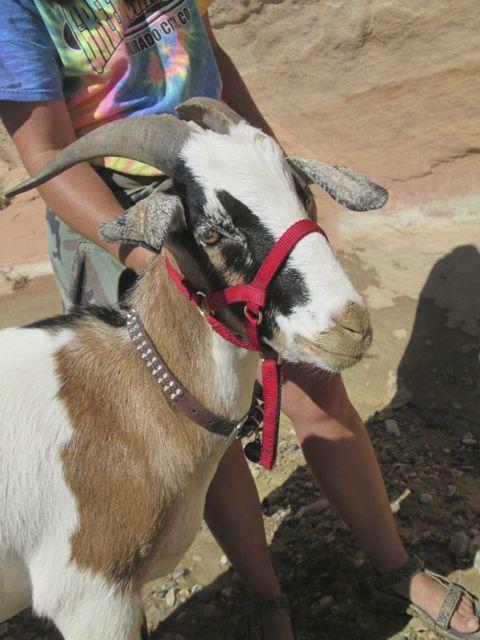 I sadly had to take him back to the truck and leave him there while the rest of us took to the trail without him. Our one consolation was that it was a very short hike and we could see the truck from much of it. It was a cool, cloudy day so I knew he would not be uncomfortable–just unhappy. We were all unhappy. Poor Cuzco! Well, I say the hike was short, but it would have been a lot shorter if we hadn’t taken a wrong turn. 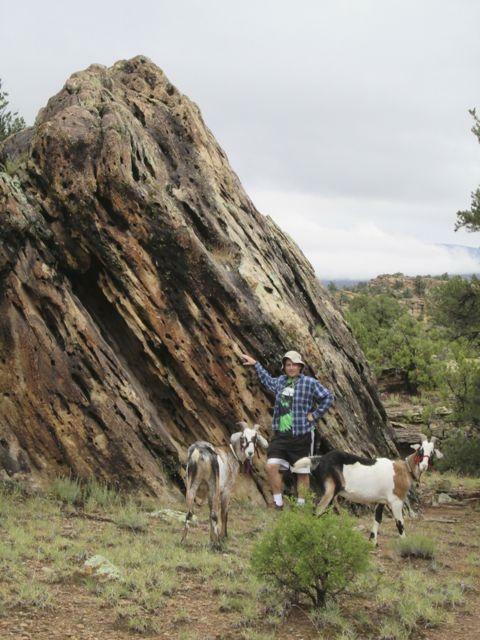 We didn’t find petroglyphs, but we found this cool pregnant-looking rock. The boys got a nice drink and we headed back the other way. 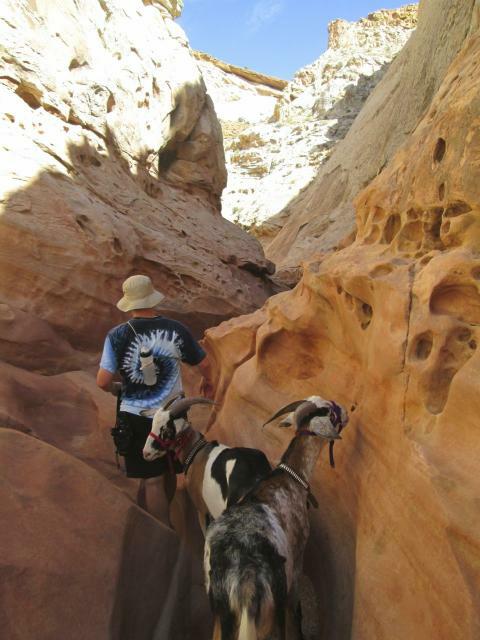 Once we got on the right trail, the petroglyphs were easy to spot. The were right at eye level! The square cuts around two of them are from early archaeologists’ attempts to remove them so they could be displayed in museums. I guess they decided the rock was too fragile or something because for some reason they gave up. I’m glad. Sputnik poses next to the image of his ancient relatives. There were more petroglyphs further on which were quite fascinating. Our photos of the most interesting rock art did not come out, but you can see it if you do an internet search for “hundred hands pictograph”. It was four rows of handprints from what appears to be many different people who dipped their hands in paint and slapped the wall. Very cool! 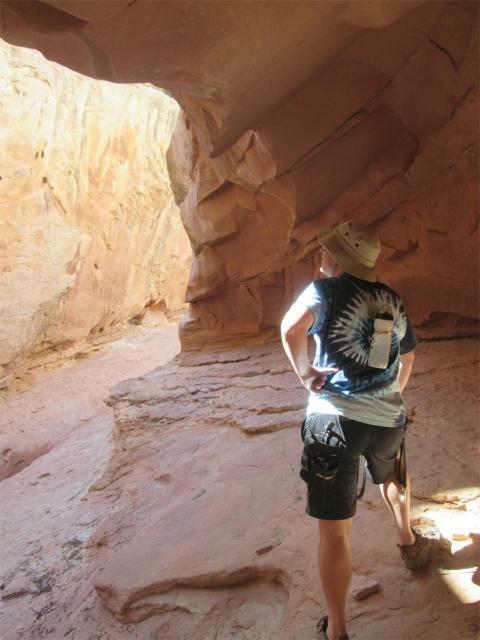 If you look closely at this petroglyph you can see a papoose! I thought this rock looked a lot like Sputnik. I kind of regretted bringing him on this hike. He was terribly upset that we left Cuzco behind and he would not stop wailing. It wouldn’t have been so bad if he weren’t so LOUD. For such a little guy he sure has a set of bellows! 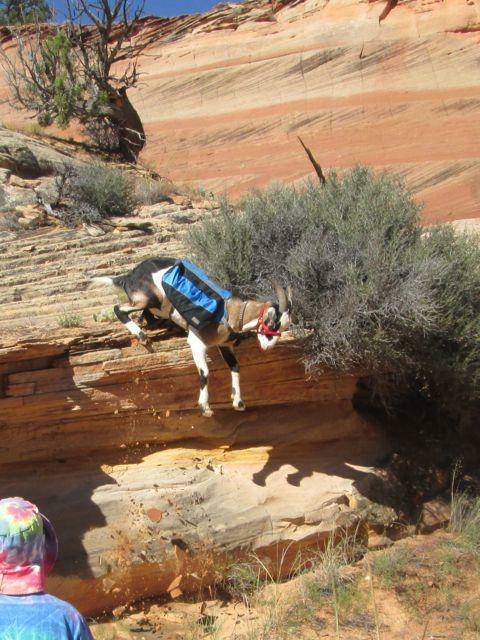 When we were loading everyone up to leave, Cuzco took off while I was rearranging tether spots. He left all of us at the truck, ran across the parking lot, and made a beeline for the trailhead. 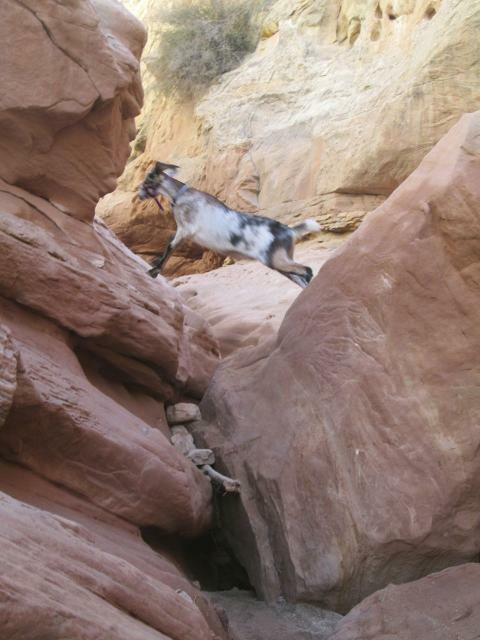 He totally ignored my calls and went a ways up the trail before I could catch him. 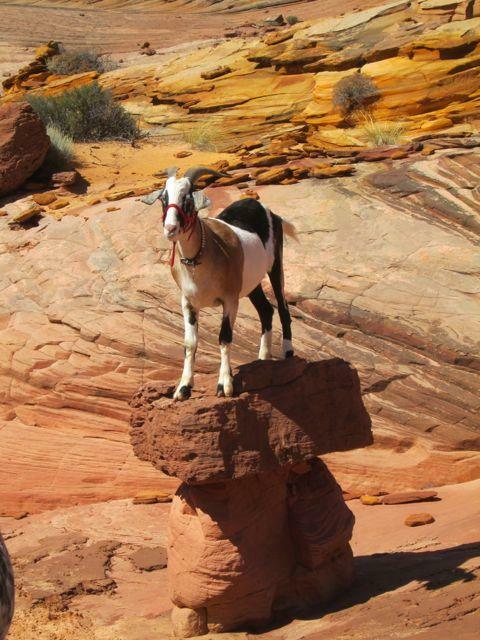 I think he was determined to take another whack at that high rock and prove to himself that he could still do it. Poor fella. It’s awfully hard to see him get too old to do things he loves. 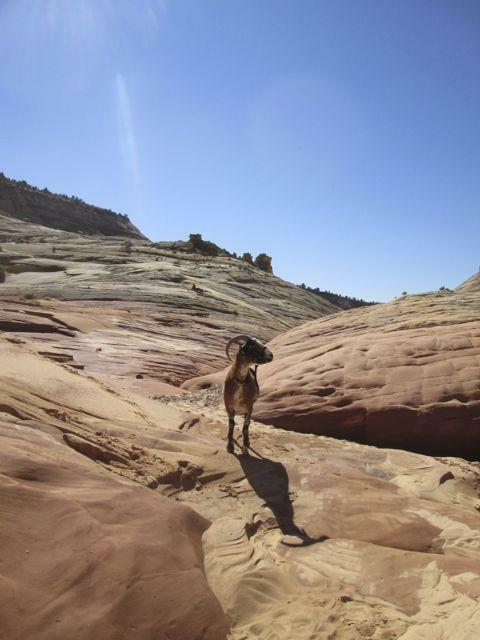 Our third day in Escalante threatened rain again, so we thought we’d pick a couple of shorter hikes outside of town where the sky looked less ominous. 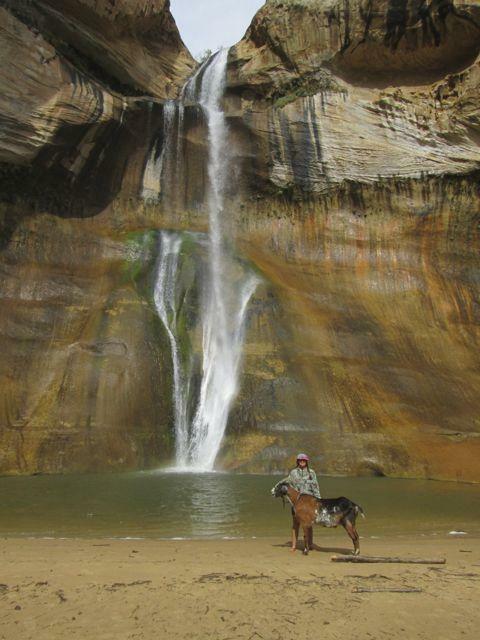 The first one was Calf Creek Falls. 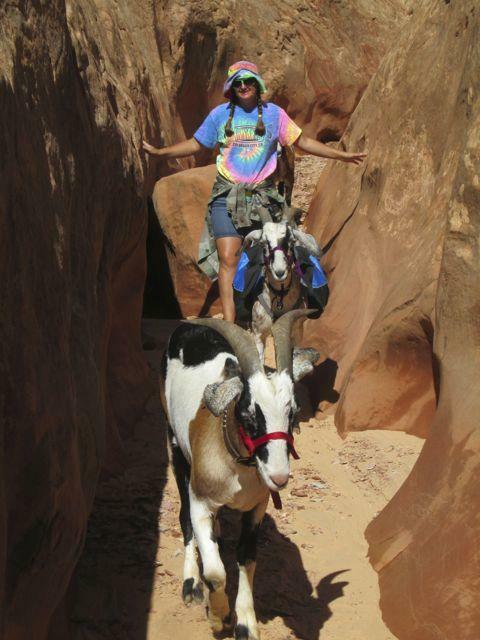 We’d been here before with Nibbles and Cuzco in 2012, but it was so pretty we wanted to see it again even though this is a ridiculously popular trail. 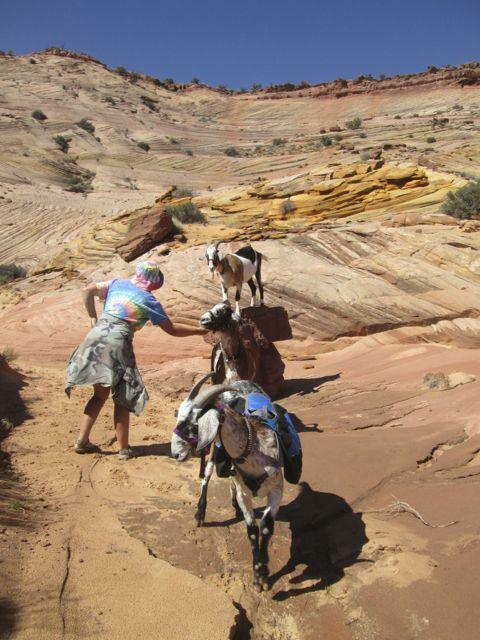 The number of people who stop us and ask about the goats makes the 5-mile round trip take a very long time. On the plus side, it is awfully fun to show off our little herd. The overcast sky made the colors less vibrant this time, and the day was much too cold to tempt us in for a swim even though when I was last here I swore I’d bring my bathing suit on the next visit. However, the falls and the pool are beyond breathtaking no matter how gray the weather. Phil wanted a picture with his goats by the pool too! Phil did eventually achieve some level of success getting them near the water. But since I’m mean, I decided that standing next to the water wasn’t good enough. 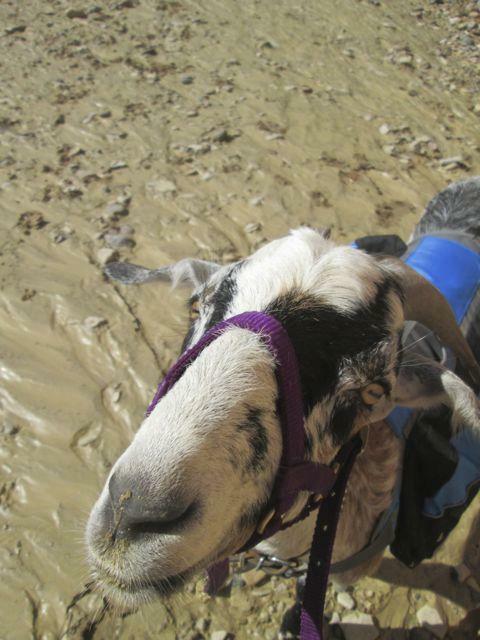 I hooked Sputnik’s halter to Cuzco’s collar and dragged him with us across the shallow end. I thought maybe Sputnik would be brave enough after one crossing to follow Cuzco back voluntarily. Clearly I was wrong. I had to go back over and fetch him, and he wasn’t happy about it. “Brave boy, Sputnik!” Nose-petting and treats were in order. I eventually decided that Sputnik had been water-traumatized enough and we made our way back to shore. It was gratifying when he followed me willingly down to the waterside to pose for a photo. It’s nice when training pays off! Finn was a lot more willing in his water lessons, and he took the courtesy of not splashing me like Sputnik had. Sputnik the drama king had a tendency to lift his front feet entirely out of the water and slap them down with each step, soaking both of us. 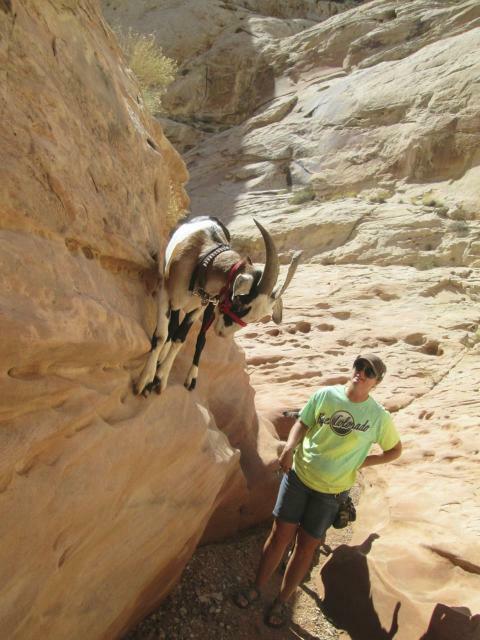 Finn walked like a normal goat, which was a nice change. 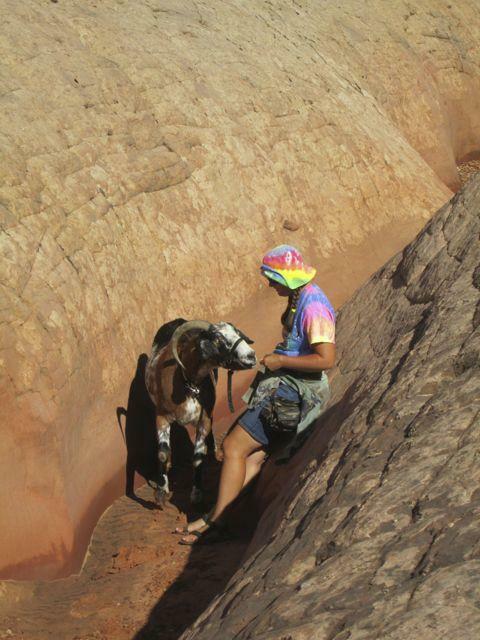 Some nice folks we met on the trail took photos of us and the goats. The trail was cool, damp sand and smooth rock the entire way, so I gave my sandals to Cuzco to carry almost as soon as we left the trailhead. He only dropped them in a few steep places where they slid off the back. For the entire five-mile trip he balanced those shoes carefully and never shook them off or tried to lose them on a tree branch. 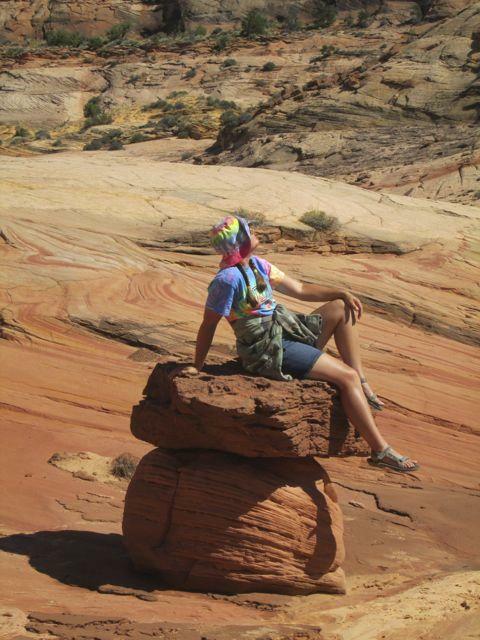 I loved hiking barefoot at the time, but I regretted it that evening. I forgot that when one walks barefoot, one places their feet differently and uses different muscles than when one wears shoes. It’s been many years since I went such a long way in bare feet, and I felt it! I ached from the hips down and was glad for a soak in the hot tub that night! 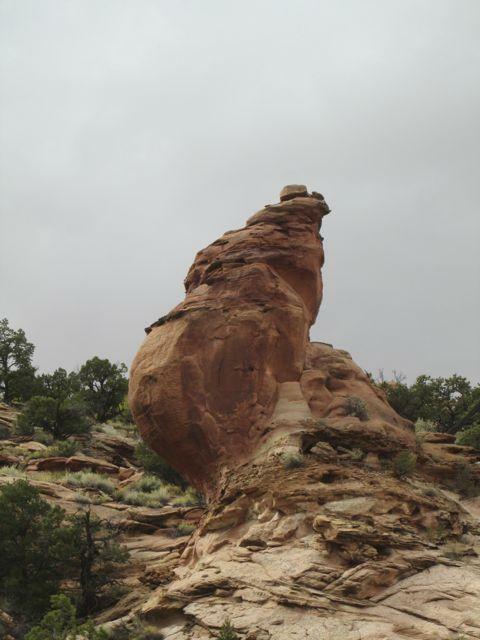 Our second day in Escalante was cold, windy, and full of rain. We spent the morning doing laundry and hoping the skies would clear but they never did. We have to be especially careful of Cuzco these days as he’s not very resistant to pneumonia in his old age. The rain gave way to sullen, brooding skies in the afternoon, so we took a chance on the weather and darted out for a brief but pleasant hike up a butte just outside of town. 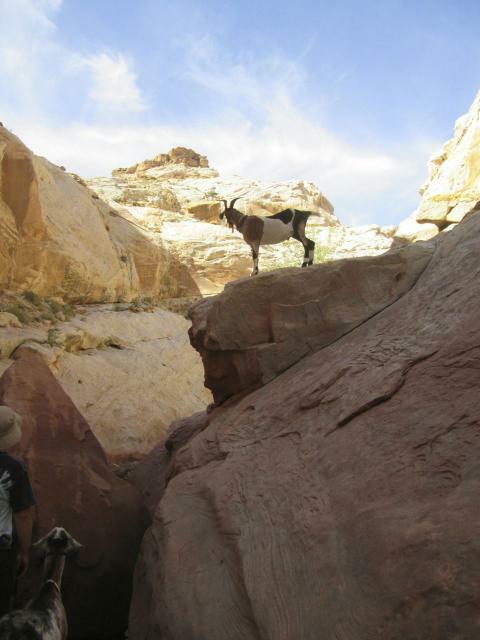 We had originally planned to go down the wash, but someone ahead of us had a bunch of rambunctious loose dogs, so we turned off the trail and made our own way up toward a cool-looking rock outcropping we could see from the valley floor. It turned out to be even cooler than we realized! 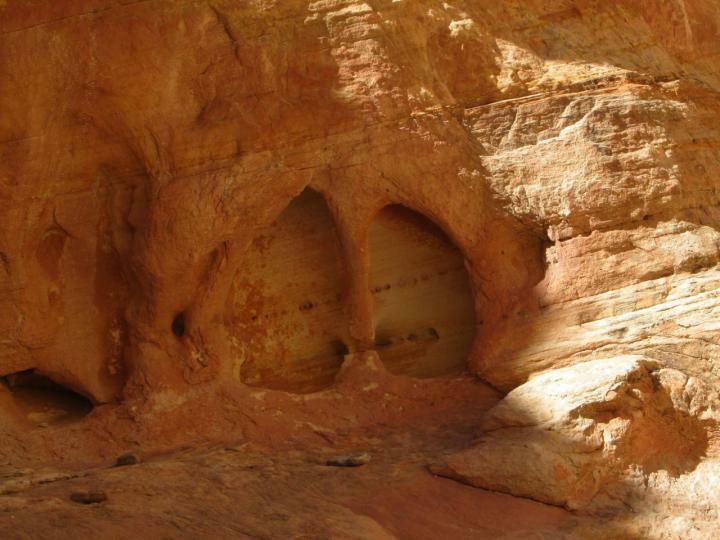 We discovered a weird, crumbling little mini-arch with a spectacular view of the town of Escalante and the surrounding valley with its beautiful rock walls and lovely green farms. If you see a small tunnel, you have to squeeze through it! I tried to get pictures of the view from the top, but the flatness of the light faded it all together and I tossed those photos. So here’s a picture of my handsome husband enjoying the view instead. We also found a cool boulder. And then it started to rain so we packed ourselves as tightly as possible under my umbrella and raced back to the truck. Finn, in a moment of blind panic about getting left behind in the rain, tried to get himself run over. I always have to back the truck up to a bank or a rock so Cuzco can get in. Finn didn’t want to wait and he bolted away from Phil and leaped into the truck while I was backing up. I didn’t even see him until he landed on the tailgate and almost gave me a heart attack. Cuzco got wet, but not too wet. I blanketed him and bedded everyone down cozy in their trailer as soon as we got back. It was a short adventure but a memorable one. 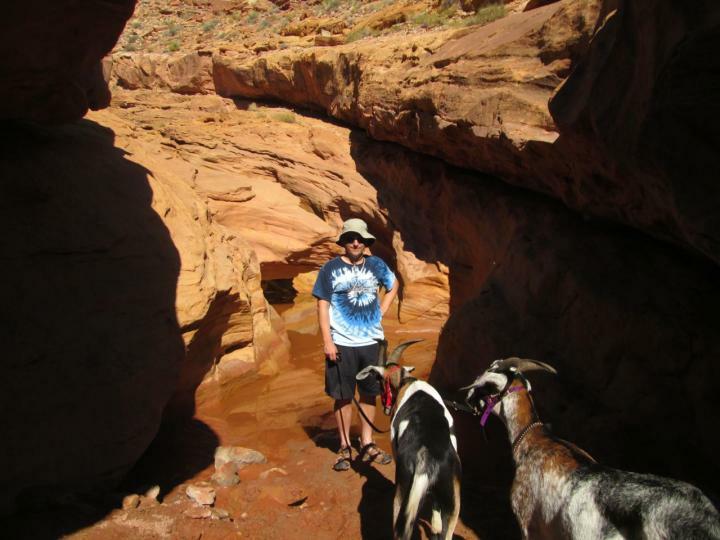 After saying goodbye to our friends and to Pac-Man at Goblin Valley, Phil and I headed out to Escalante. 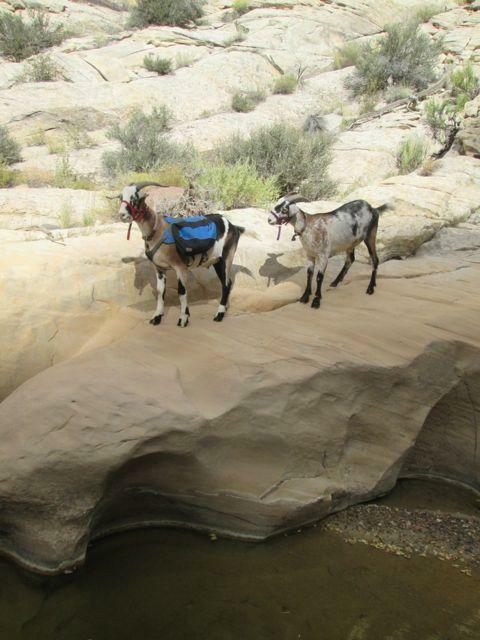 We spent a relaxing first day hiking up the Escalante River (which was really more of a trickle), and it was a great opportunity for the younger goats to practice getting their feet wet over and over again. Sputnik had the honor of carrying our food and water that day. This little Outward Hound dog pack was super cheap and it’s not perfect by any means, but as long as we adjust the straps correctly and balance the load exactly, it seams to stay neatly in place most of the time. It held up better than I expected on this trip, considering how often it was scraped on branches and rocks. 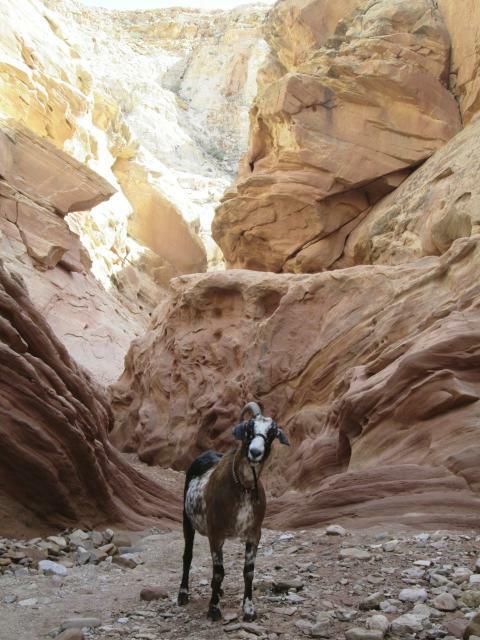 We were surrounded by beautiful, high canyon walls for the entire hike. 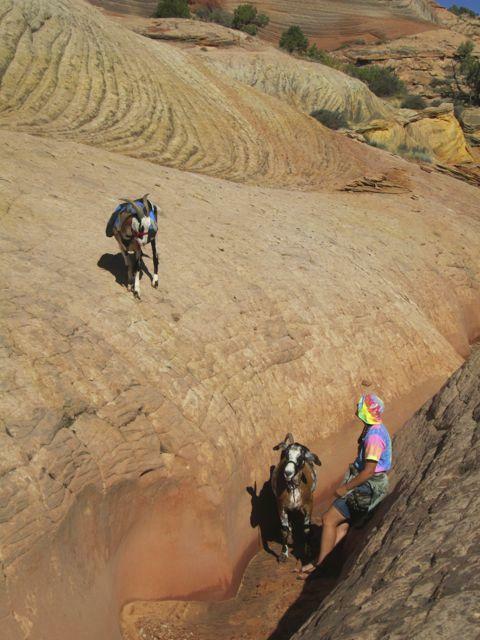 At one point, Phil and I used “math skills” to estimate the height of the cliffs. I looked at a tall pine tree way up on the wall and estimated the height of the tree, then estimated how many would have to be stacked on top of each other to reach the top. I arrived at 450 feet. Phil thought that might not be accurate, so he used a stick to measure the height of the wall (one stick length) compared to the length of his arm (two stick lengths). Then I paced off our distance from the wall, which turned out to be about 900 feet. Whether we were right or wrong, at least there was no argument. 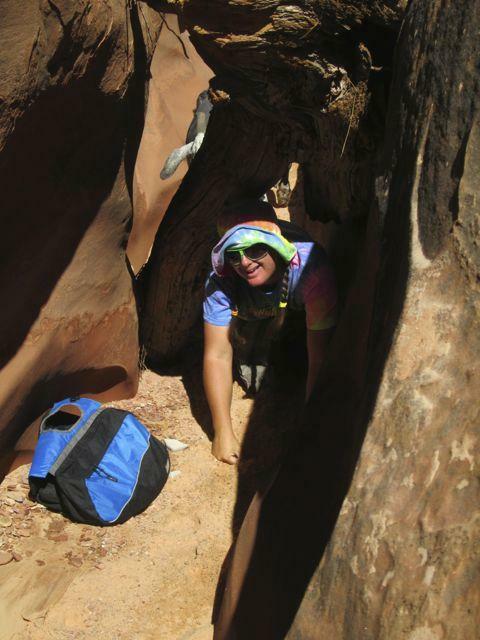 We came on the Escalante hike two years ago, and we were surprised this time to see that the rock art had recently been “modernized” by what appear to have been some teenaged visitors wielding charcoal lumps from a nearby fire pit. A nice couple took a photo of us and our goats in front of this mix of old and new graffiti. Sputnik is shaping up to be a pretty decent hiking companion. He seems to enjoy carrying a pack. 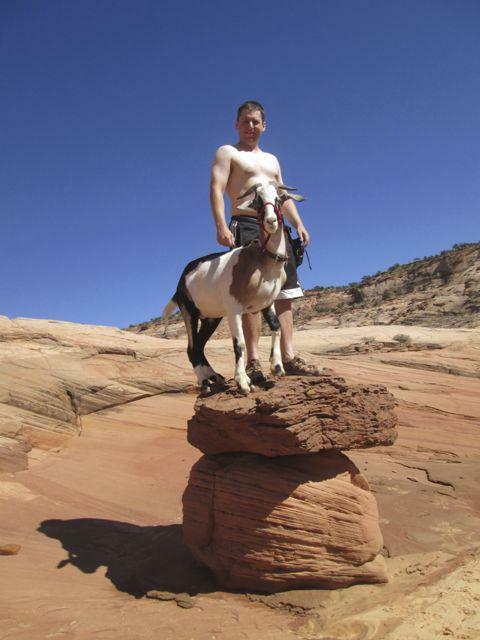 I think it gives him a sense of purpose and importance–a feeling a bottom-tier goat doesn’t often get. 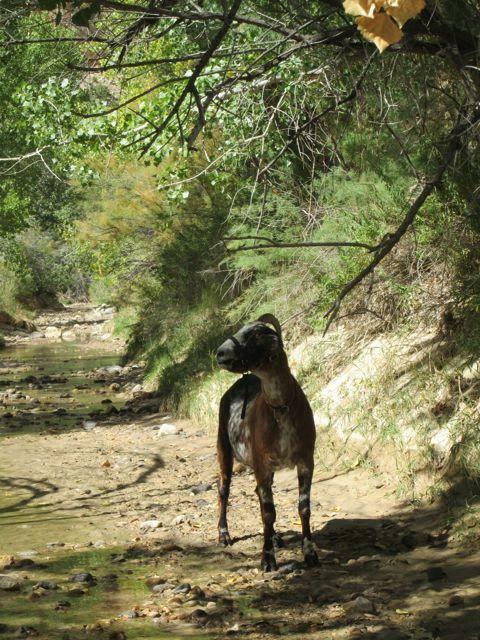 There was plenty of shade on this hike, and a creek to keep our toes cool. This was especially nice for Cuzco, who is definitely beginning to feel his age. 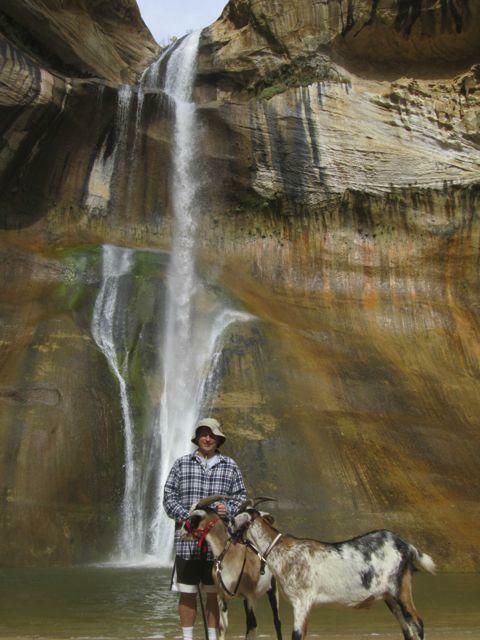 He hiked 12 miles to Wild Horse Window and back and never once lagged or complained. 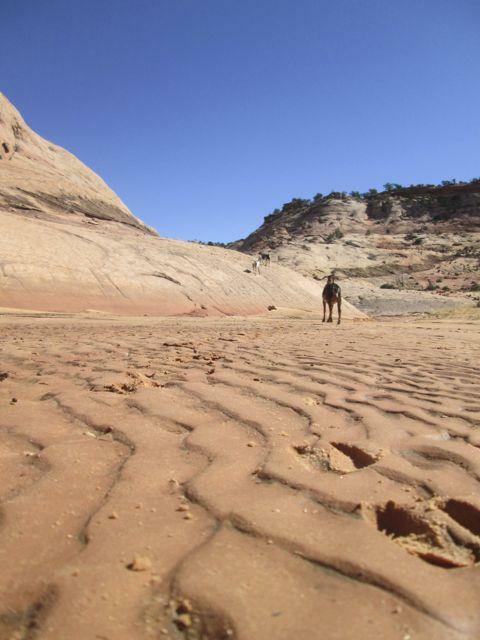 And Phil and I probably took him about 10 miles on this Escalante hike even though he had spent the previous day walking the hard surfaces of Goblin Valley and riding in the trailer over the winding, twisting State Highway 12. 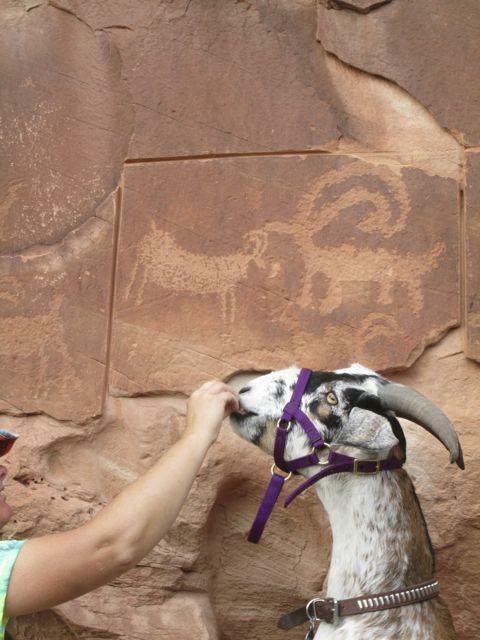 But in spite of his creaky joints and shortness of wind, I think Cuzco truly enjoys these expeditions. And he’s a great example to the yearlings. 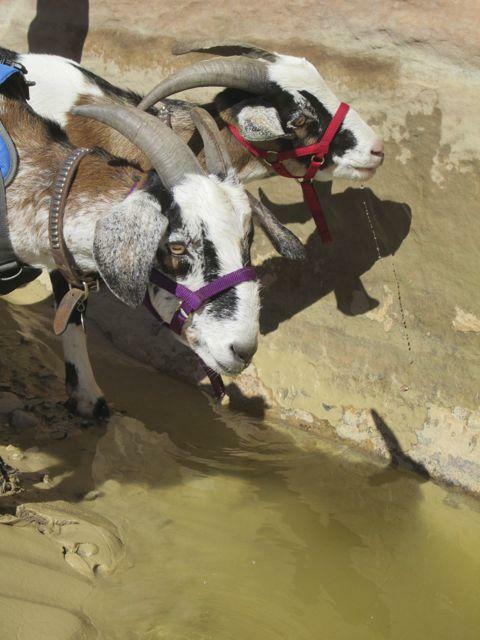 Cuzco bravely crosses water that the younger guys will do almost anything to avoid. Finn took charge of the pack on the way back. 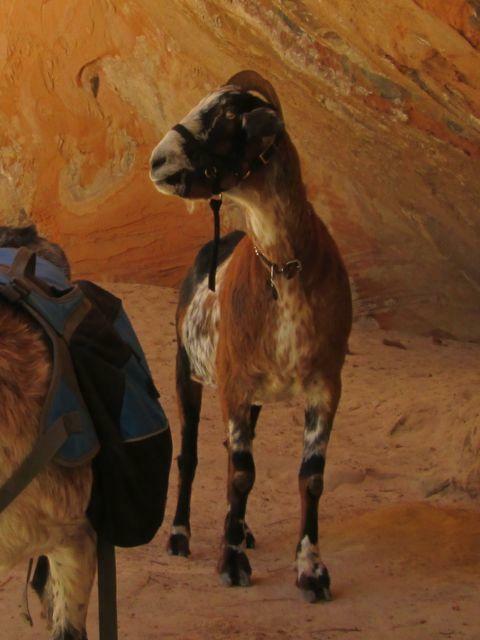 Since they are only yearlings, we kept the pack lightweight and we never made either one carry it for the entire hike. 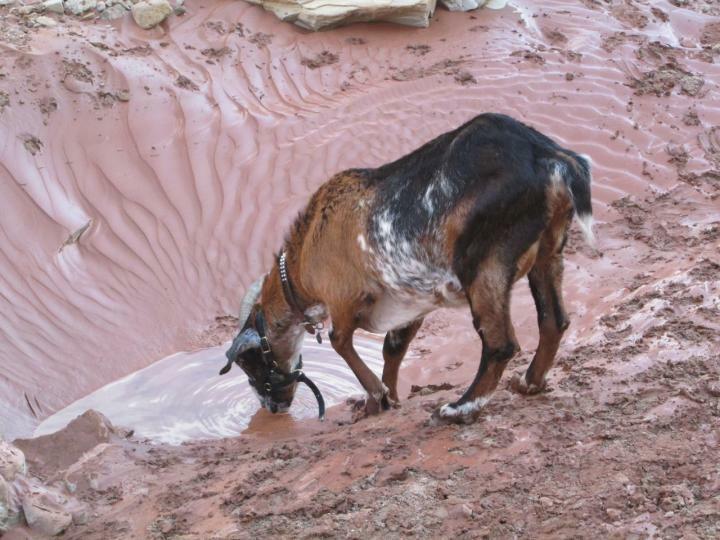 Speaking of goats not wanting to cross water, this is what happened when Finn led instead of Cuzco. Cuzco stares bemusedly after Finn’s questionable choice of navigation. 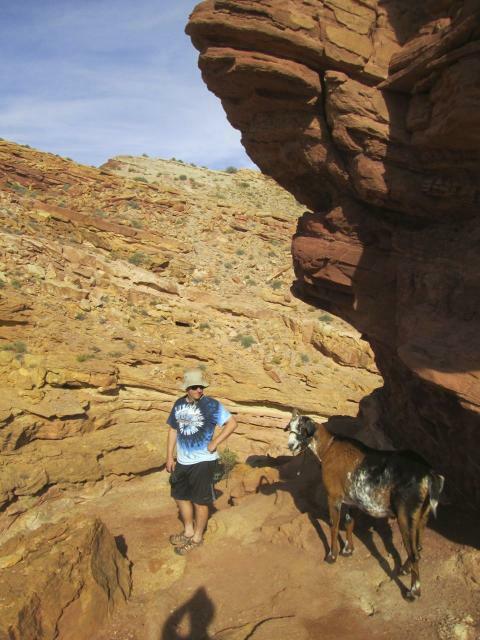 Sputnik spent our entire time in Escalante expressing his undying opinion that Finn is an infallible leader. Sputnik became Finn’s shadow, and since Finn is showing early signs of becoming an incredible packgoat while Sputnik has always possessed some fairly questionable personality traits, I can only think that this copycat behavior is a good thing. Would you like a side of ham with that? Ok, now this is just a bit much!